If you have ever visited Belize, done some research into Latin America or considered buying real estate in the country, then you probably already know a lot about this awesome location. However, there is always more to learn about Belize and its incredible beauty, population and history. Discover these seven interesting facts to get a deeper understanding of Belize and all that it offers. Although Belize is located firmly in the heart of Central America and is bordered by countries such as Mexico and Guatemala, its national language is not Spanish. In fact, the official language of Belize is English, which makes getting around and being understood easy for travelers. However, you can still expect to hear Spanish, Creole and even Maya spoken by locals throughout the country of Belize. Despite its relatively small size, Belize is packed with ancient ruins, many of them dating back to the Mayan civilization. There are so many ruins, in fact, that some have been paved over or knocked down in the past to make way for homes or developments. Thankfully, many of the largest and most historically significant remain and can be visited by travelers and residents alike. Each year, more than one million visitors flock to Belize for relaxation on the beach, adventure in lush green jungles and incredibly vibrant culture. While that number might not surprise you, you might find it interesting to note that more than 70 percent of tourists come from North America. In some coastal destinations, the water temperature can fluctuate wildly from season to season. In Belize, however, you can take a dip in the refreshing water any month of the year, because the temperature remains between 79 and 83 degree Fahrenheit all year long. Currency exchange is a major issue for many travelers embarking on a trip to Belize or anyone seriously thinking about making a real estate investment in the country. However, the exchange rate between the US dollar and Belize dollar remains at 1:2 day in and day out. This fixed exchange rate makes it easy to determine how much you're spending as well as how to predict and budget for living expenses in the future. Since Belize operates under a parliamentary constitutional monarchy and is a commonwealth of Great Britain, its official head of state is none other than Queen Elizabeth the II. Of course, the Queen resides in the United Kingdom, so the acting head of government in the country is the Prime Minister of Belize who works in conjunction with the Governor-General. Belize is bursting with scenery, ruins, beaches and culture, but it still only occupies less than 9,000 square miles of space. That means that all but three American states are larger than Belize. The country of Belize is only larger than New Jersey, Delaware, Connecticut and Rhode Island. 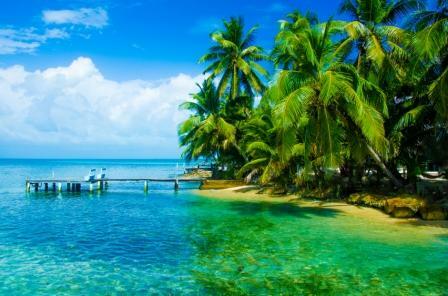 Belize is a fascinating country, making it a top choice for travelers from around the world. Whether you are looking for a vacation home, a full-time residence or just a quick getaway, you will always find something new to explore while in Belize.